A new restaurant aims to serve up a fine dining experience in a hometown atmosphere. horFrost, Portage la Prairie’s newest fine dining restaurant. A new restaurant aims to serve up a fine dining experience in a hometown atmosphere. horFrost, Portage la Prairie’s newest fine dining restaurant, opened on Oct. 17. It’s owner and manager, Chris Kehler, is eager to welcome Portagers with a unique menu inspired by international cuisine. “This is really fine dining without the stuffy service”, he said in a recent interview with The Graphic. The young entrepreneur is no stranger to the culinary world and fine restaurant management. Kehler learned the art of providing quality service from his father who owned and managed a family restaurant in his hometown of Steinbach for 40 years. “It really is about people and the best quality food and service you can provide”, he said. The restaurant, located at 190 River Rd., seats 44 people and employs 10 staff, who are being trained daily. Although the restaurant aims to give patrons a fine dining experience, there is no dress code and Kehler encourages a casual atmosphere. We want this to be the kind of place you can bring your friends and just relax and have a good time and enjoy a unique menu at a reasonable price. Kehler decided to take ownership of that experience by starting up a new restaurant with the help of chef Jeff Mialkowski, who is trained in classical and French-style cuisine. Mialkowski takes much inspiration from his travels. Peruvian chicken and Australian salads are just a few of his internationally inspired dishes. He formerly cooked at Durovnik’s in Winnipeg and The Manitoba Club. His creativity shows with a twist on some classic items including unique sauces for steak, pickerel pan served with lemon vodka and dill butter, and radish and roasted garlic dip. Items on the menu range in price from $14-$30. The restaurant is open from 5 p.m.-10 p.m. and reservations are recommended. For now, horFrost is only serving dinner, but Kehler hopes to introduce a new lunch menu by early November. Kehler is trained in business management and has experience working with various fine restaurant chefs. He also managed Pasta la Vista, a fine-dining restaurant in Winnipeg for almost two years. A year ago, he recognized a need for the fine restaurant experience outside of Winnipeg. “We know coming from small towns ourselves that often we’d have to drive out to Winnipeg if we wanted to have a nice meal or a night out. It gets kind of tiresome after a while and also with the price of gas”, said Kehler. Portage won out over Winkler, Steinbach and Morden, as the ideal location for horFrost. “There seems to be a large number of people we feel we can cater to like working professionals, the real estate market is going up slightly and there’s real growth happening in Portage right now”, he said. So far the restaurant has received good reviews, judging by the number of tables filled each night. “It’s been busy every night since we opened really. Last night, we only had room for maybe two walk ins. Most tables were full by 7 p.m. and others had reservations”, said Kehler’s wife Charis, who offered her assistance as a greeter on Saturday. 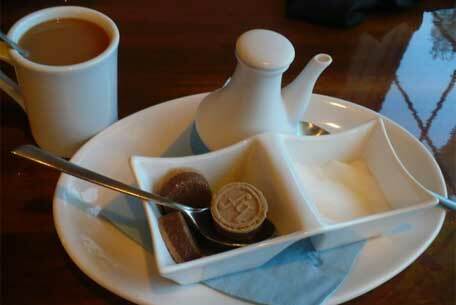 After-dinner coffee, served with beautifully pressed pucks of sugar, at Horfrost.